The world seems to be going Artificial Intelligence (AI) crazy! 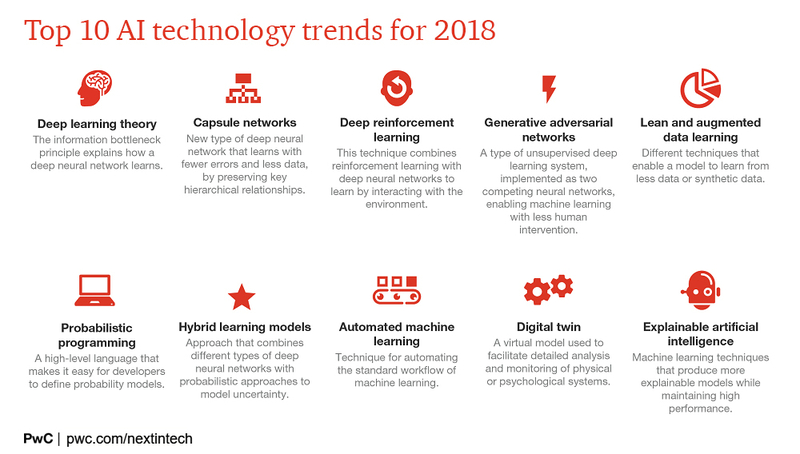 So in this post i thought i would cover the 10 Artificial Intelligence AI Trends highlighted by PwC for 2018. Its about 6 months old now, but the themes are relevant and i wanted to capture (for my own notes) the AI trends in layman terms. This is where a neural network has the ability to learn by engaging with the environment through observations, actions and rewards. DRL is popular type of AI, often used in business applications and gaming – e.g. AlphaGo developed by Alphabet plays the board game Go and beat the current human champion! Mixing up different types of deep neural networks (which do not model uncertainty) with various probability approaches (perhaps humans) to come up with a hybrid solution that makes the most of both!